Here’s the latest indicator of the development of Chinese film in a global context. American-based Asia Releasing, which currently distributes Chinese films in North America and Australasia, has moved into UK distribution with a limited ‘day and date’ release of the third in the ‘Lost‘ franchise of Chinese blockbusters, Lost in Hong Kong. The film opened in major city centre Odeons in Liverpool, Manchester, Birmingham, Sheffield and London in its first week. In the second week it expanded to include screens in Newcastle, Edinburgh and Oxford. 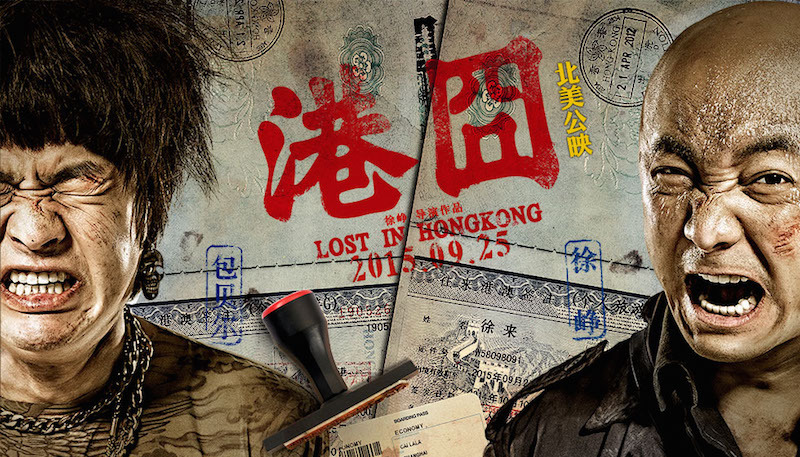 Lost in Hong Kong grossed over $100 million on its first weekend in China and became the Chinese film with the biggest opening day box office. The high profile of the film meant it wasn’t too much of a gamble in attracting Chinese students in the UK (the largest Chinese student group in Europe). The film is also likely to appeal to the Cantonese HK diaspora because, as the title implies, it pays hommage to both Hong Kong the city and the popular Hong Kong films of the 1990s. In its first weekend in the UK Lost in Hong Kong made No 14 in the chart with a screen average of £9,477 – the highest for any title except Secret Cinema’s The Empire Strikes Back. Showings of major Hong Kong films during the Chinese New Year period have been relatively common in London and Manchester for several years, but otherwise Chinese film fans have had to wait for UK distributors to release Chinese art films or for occasional limited cinema releases of popular genre films which usually find their audiences via DVD. In that context the Asia Releasing strategy is innovatory and matches the current UK practice with blockbusters from the Hindi and Tamil film industries. The Lost franchise began with the relatively low key Lost on Journey (China 2010) starring Xu Zheng. Lost in Thailand (China 2012) caught the imagination of the rapidly-growing mainstream Chinese audience and became one of the biggest box office winners of the last few years. Xu directed the second film himself and the cast included other internationally-known stars such as Fan Bingbing (as herself). I haven’t seen either of these two previous films but I’ve read comments on them that suggest a central plot idea that sends Xu on a journey which will see him entangled with a character who is bound to get him into trouble and the result is a ‘comedy-adventure’ narrative with broad humour and numerous stunts. One reviewer referred to the ‘Road’ films starring Bing Crosby and Bob Hope from the 1940s to 1960s (the last of which was The Road to Hong Kong in 1962). This seems a good reference and in contemporary cinema, Lost in Thailand has been seen as riffing on the Hollywood Hangover films. I had two disadvantages watching Lost in Hong Kong. I haven’t visited Hong Kong and I haven’t seen enough Hong Kong films to spot all the allusions and to get all the jokes. Having said that, several references were signalled so clearly that even I couldn’t miss them. At one point a DVD of Peter Chan’s Comrades, Almost a Love Story falls to the ground. There are also explicit references to Wong Kar-wai’s Chungking Express and 2046. At other times, though, it’s necessary to recognise actors, directors or locations to appreciate the joke. I’m sure the mainly young Chinese audience behind me laughed more often than I did. These films are part of a developing industrial franchise but they don’t utilise the same characters. I think that only Xu Zheng himself is a constant alongside the narrative formula. Lost in Hong Kong begins with a nostalgic flashback to the college days of the three central characters – something of a current trend in films catering to the 1990s generation of students? Xu Lai (Xu Zheng) is an artist/designer who falls in love with artist Yang Yi (Du Juan) but is being pursued by business major Cai Bo (Zhao Wei). When Yang Yi leaves to go to Hong Kong, Cai Bo is successful in her pursuit and the couple are married with Xu becoming a designer of brassieres for Cai Bo’s family lingerie business. Twenty years later the family takes a vacation in Hong Kong. The whole family is concerned that Cai Bo has not yet produced a child but Xu is hoping to sneak off to the opening of Yang Yi’s major new exhibition. His only problem is that his brother-in-law, the manic man-child Cai Lala (Bao Bei’er) insists on following him everywhere with his video camera, claiming he is making a personal documentary. When Cai Lala inadvertently films a crime, he sets up the possibility of a chase. This will then take up most of the narrative. I’m not usually a fan of action blockbusters and I went to the screening out of purely academic interest but I confess that there were some long sequences that I enjoyed partly because of Xu’s performance and partly because of the sheer skill and creativity of the action stunts. Some of the very broad ‘family humour’ was familiar from the Alls Well, Ends Well HK comedies and it was interesting to try to think about which famous HK action films might be the inspiration for various stunts. From my limited viewing of mainstream Chinese films I was surprised that Zhao Wei (‘Vicky’ Zhao) was so under-used – I think of her as a major star who is here presented in a very unflattering way. Several scenes – including the climactic action scene – are played out high up on skyscrapers. So beware if you suffer from vertigo. I wondered whether this was again a specific Hong Kong film culture reference. As well as the rooftop scene from Infernal Affairs, suicides from tall buildings feature in several films (and in real life in the case of Leslie Cheung). Overall I thought Lost in Hong Kong, as a ‘global film’, stands up well in comparison with Hollywood as well as Hindi and Tamil blockbusters. Watching it I was reminded of some recent ‘Hindie’/New Bollywood films like Delhi Belly or 3 Idiots. The latter did become a global film that performed well in Hong Kong cinemas. I wonder if Chinese producers will one day think of making Lost in Mumbai? An outline history of developments in Chinese Cinemas (PRC, Hong Kong and Taiwan) is given in Chapter 11 of The Global Film Book.